The Rolls-Royce Phantom Coupé is a British handmade (except chassis) coupe manufactured by Rolls-Royce that debuted at the 2008 Geneva International Auto Show in Geneva, Switzerland, on 6 March 2008. 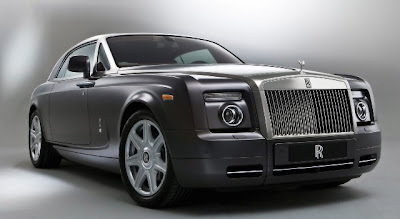 The platform is based on the 2003 Rolls-Royce Phantom and has styling heavily derived from the Rolls-Royce 100EX, a concept car unveiled to celebrate the company's centennial in 2004. Its interior includes leather and wood veneer. There is a button to close the "coach doors". Rolls-Royce currently has plans to build an electric Phantom.